Recycling is near and dear to my heart. When I was an elementary school teacher one of the morning rituals I did with my third graders was to read a recycling tip and discuss how we could incorporate the suggestion into our daily lives. I loved the conversations we had sparked by these tips and I felt good knowing I was empowering my students to be “green”. I guess I have always been a big believer in sharing tips! Below is a picture I snapped while leaving Whole Foods in Yonkers, NY that shows a recycling bin for cell phones. 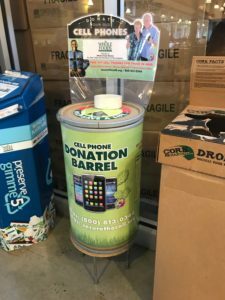 Whichever method you use, be sure to wipe clean your phone first or donate to an organization that does that for you. Storage tip: I am fanatic about using recyclable bags when I shop but there are occasions where I do end up taking a plastic bag home. They were overtaking a corner of my kitchen until I saw how one of my friends tames them: he folds them and pushes all the air out, and then stuffs them into a paper towel tube. You’d be surprised how many fit in there, and how much storage space it saves. What a cool space-saving idea! It sounds so easy to make and I can’t wait to give it a try. Do you have a photo of one to share? Also, GREEN Kudos to you for shopping with recyclable bags! !